Local food is irreplaceable, but sometimes even the most passionate advocate of "eating where you live" feels a temptation to taste someone else's terroir. With the price of jet fuel hitting all-time highs, the cheapest way to travel is through the taste buds - by sampling ale brewed in an ancient Belgian monastery, or dreaming of the desert while sprinkling hand-ground African spice blends into a stew. Or basting a roasting chicken with the freshest cold-pressed olive oil from a small farm. Providing such authentic - i.e., artisanal, small-batch - imported foods from Italy is the raison d'être of Verde Montagne Imports & Travel. In a converted house in Shelburne, up a narrow, creaky flight of stairs above Ink. Ink. Fine Stationery, a little slice of "the boot" awaits. Unlike larger importers, Verde Montagne, which opened here in early July, uses just one source. It offers a small but impeccable selection of products from a single, organic-certified Italian farm, inn and restaurant - Fattoria Lischeto - located just outside the Tuscan town of Volterra. The family-run farm operates on renewable energy, working on the principle that healthy land, healthy animals and healthy people are inextricably connected. And owner David M. Huff, 30, can tell you all about it. He got to know Fattoria Lischeto and its second-generation owner, Giovanni Cannas, through his father, G.M. Huff, who organizes group trips to Italy. After discovering the farm nearly 10 years ago, the elder Huff began including it as a stop on his customized tours. "He was absolutely blown away by the quality of food and the service," his son recalls. "[Cannas] brings them in, shows them the cheese, and cooks for them. It's a real hands-on experience." But it's luxurious, too. The rustic, renovated farmhouse boasts an in-ground swimming pool, terraces overlooking rolling hillsides and outdoor casks used for skin-nourishing milk baths. The small Shelburne outlet for Fattoria Lischeto's products is tidy and organized, furnished with a combination of modern wood shelving units and a few antique desks and tables. The walls bear owner Huff's accomplished photographs, taken during his extensive travels in Italy. There are shots of the countryside, the Coliseum and boats in Venetian canals. 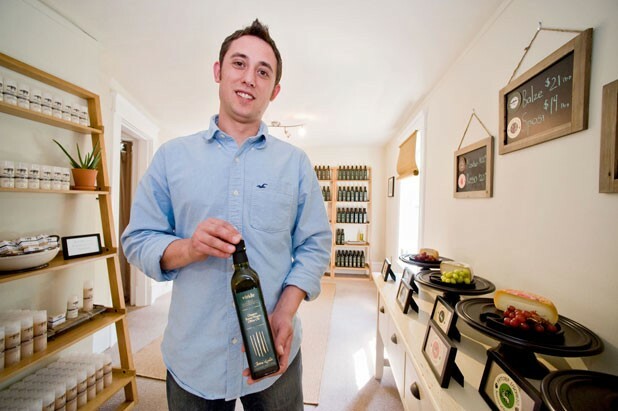 On one set of shelves, deep-green bottles of unfiltered, estate-bottled olive oil stand in serene rows. Samples come from a cruet filled with the thick liquid. Nearby sit jars of viscous golden honey in two varieties - acacia and wildflower. On an antique table, half-wheels of various Pecorino cheeses rest under glass domes beside clusters of grapes, looking like still-lifes in a museum. Finally, non-edible cosmetics boast some of the same ingredients as the food. Soap, lotion and "body shampoo" get their rich texture from olive oil and sheep's milk, scented with natural fragrances. Customers can sample any of the artisan offerings, including slices of cheese cut from fresh wedges kept refrigerated in the back room, before they opt to buy. "I have a tremendous amount of confidence that once people try the products they'll be coming back in the door," Huff says. While a taste of organic Tuscany isn't exactly a bargain - a half-liter of olive oil costs $18.95, and the cheeses range from $19 to $22 dollars a pound - the prices don't seem unreasonable, either. "To be honest with you," Huff explains, "they're a couple of dollars below market value. I choose to make less of a profit margin." Looking relaxed and tan, Huff appears almost too young to be the owner of a high-end retail storefront as well as a budding wholesale distribution biz, called DM Huff Organics. But he can talk the talk. "I am my own distributor," he says, "and that translates into price and quality for the consumer. When products come right from the source to the shelf and there's no middle man, everybody benefits." Huff inherited his business sense from his dad and his grandfather, who owned a shipping company. With a history degree from the University of Kentucky and some work for his father under his belt, Huff decided to follow his entrepreneurial instincts and launch his own company. He pulled it off with the help of an inheritance and savings from his twenties. "The independence of working for yourself and the way [my father and grandfather] ran things made me want to do the same thing," Huff explains. Why formaggio? "I'm passionate about traveling, and I really love food." Huff's business comprises two distinct branches. Via DM Huff Organics, he supplies Fattoria Lischeto's cosmetics and comestibles to grocery stores and restaurants, mainly in his native New Jersey. He calls this the heart of his operation, and hopes to eventually expand it nationwide: "The idea is to stretch ourselves across the United States, from New York to L.A." But no matter how big his business gets, Huff emphasizes, he plans to keep its home base in Vermont. Not for nothing did he name his business the Italian version of "green mountain." During childhood visits to his family's vacation home in Chester, Huff relates, "I absolutely fell in love with the state. After college, I was convinced that I was going to move somewhere in Vermont, and I felt that the Burlington area had everything I wanted." Now, when he's not infiltrating markets around the nation, Huff is offering his premium products to the community he's chosen as his home. Because Huff holds an exclusive agreement to carry the Italian farm's creations in New England, Verde Montagne is the only place in the region to try the pungent Pecorino Rosso, rubbed with a mixture of farm-grown-tomato paste and olive oil. Or the fresh-tasting baked ricotta, which is sublimely drizzled with fragrant, perfumed wildflower honey. When a couple of customers wander in - a Charlotte woman and her college-aged daughter, fresh from a year-long stint in Italy - Huff offers to slice some bread so they can try the oil. "That's really good olive oil," mom Irene Horbar raves. And these two are connoisseurs: Horbar says a childhood visit to an Italian oil press sparked her daughter Marie's fascination with the culture. "We order olive oil from California," she tells Huff. "Your product is so amazing, I'd pay anything for it." That's just the sort of response Huff is hoping for, as he seeks a gourmet-minded clientele. Right now, he sells some award-winning ricotta to the Shelburne Supermarket, and he hopes to expand into stores such as City Market and Healthy Living, as well as restaurants with fine cheese lists. So far, Huff hasn't engaged in any "aggressive marketing" in the area, he says, and he doesn't see his wares as rivals to local organic products. "I really respect the whole 'eat local' thing, and I think the Vermont Fresh Network is great - I'm not looking to compete with that at all," he assures. "There's nobody who makes Pecorino cheese or baked ricotta in Vermont." The way he sees it, his goal is simple: to provide distinctive products to a community with a deep appreciation for delicious food stuffs and for the care and thought that goes into everything Fattoria Lischeto produces. But to get locals talking about Tomini al Farro, a cheese studded with wheat groats, or Pecorino Balze Volterrano, which is coated in ash and olive oil and aged for 60 days, Huff must first get them in the door. And he's the first to admit that his second-floor location is a deterrent. "They can't see into it. It's a challenge to get people to come into a space they can't see," he says. But Huff quickly admits he likes challenges: "I think they're fun. Why make it easy?" Another hurdle: the language barrier between him and his sole supplier. "[Cannas'] English is a little challenging; my Italian is a little challenging," Huff says with a sigh. "It's a learning curve." But if he sometimes has trouble making himself understood overseas, the tastes of wildflower honey and straw-colored, nutty Pecorino Maschio speak for themselves. Pecorino Balze Volterrane: Young and grainy, with pleasant barnyard aromas. Coated in olive oil and olive-tree ash. Aged 60 days and then matured in oak barrels. Pecorino Rosso Volterrano: Piquant and full-flavored cheese. Rubbed with a thin layer of olive oil and tomato paste. Aged 60-120 days. Pecorino Maschio: Amber, nutty and dry, with a good bit of salinity. Rubbed with olive oil "sludge." Cave-aged for more than 180 days. Pecorino degli Sposi: Mild and delicate, with a lower fat content, but still creamy. Aged 60-120 days. Tomini al Farro: Subtle, springy fresh ewe's milk cheese studded with nutty wheat groats. Not aged. Tricotta Divina: A delicate yet dense, fresh cheese made from whey and baked for several hours. Not aged. Gold-medal winner at Formaggi Vincitori BioCaseus, an annual, international organic cheese competition.